All lessons are given by a staff of highly qualified professional instructors. Please direct all inquiries to the Skating Academy Coordinator. The IceForum staff will do their best to answer any questions when the Skating Academy office is closed. The IceForum offers 8 week semesters throughout the year. This extensive schedule allows many opportunities for new enrollments as well as for continual training year round. Levels Youth Basic 1 through Youth Basic 8 exist for skaters aged 6 - 18. Adults and their family members aged 15 and above may participate in our accelerated Adult Basic 1 - 6 classes. For our youngest skaters, aged 3 - 6, we have the Snowplow Sam Series, levels 1, 2, and 3. Tots who pass all three Snowplow Sam levels, and who demonstrate the emotional and intellectual maturity necessary for the Youth Basic series, may continue at that level. 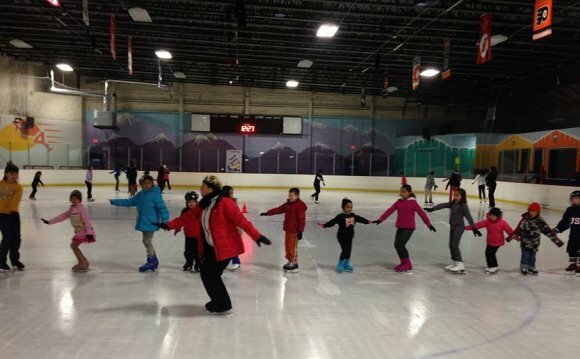 Skaters who pass Youth Basic 8 or Adult Basic 4 may progress to our advanced level classes: Freeskate 1-6. Skaters at or above this level may also choose to take private lessons. Skaters should consult with an instructor for information on private lessons and advanced skating levels. For more information on our curriculum, visit the U.S. Figure Skating Basic Skills Program website. On the first day of class, students should arrive at least 15 minutes early. Students must bring their class registration card to every class and have it checked off at the front counter. Students must also have their class registration card in order to be admitted to the free practice session. Lost cards may be replaced for a fee. All skating class levels and the instructor's names will be posted rink side. Students will meet their instructor on the ice. At the time of the second and remaining classes, students should meet their instructor on the ice. A student/teacher ratio of 15:1 will be maintained whenever possible, with the exception of the Snowplow Sam classes which will have a ratio of 12:1. Classes with less than five skaters registered may be combined with other age groups at the same level. Class registration dates and times are written on the registration schedule and will be posted at the rink approximately 4 weeks before the next semester is scheduled to begin. Registration must be done in person and paid in full during registration times only. Students who wish to continue their enrollment should consult with their current instructor to determine the appropriate class level to be assigned in the following semester. Students have the opportunity to make-up missed classes at any time during the first 6 weeks of the semester by attending the same level class on another day. Persons should refer to the class schedule for a list of all class levels and times or call the Skating School Coordinator. Students do not need to notify the IceForum when they will be missing a class or making up a class. When making up a class, students must check in at the front counter with their registration card. No make-ups will be allowed weeks 7&8..